Students stand in the middle of Speedway during the protest, chanting and holding signs. Rimsha’s friends Sarah and Angel had already been planning a response, so she was added to their chat and plans began to form. “Within 24 hours, we saw about 1.4k people interested in our Facebook event, so that was really amazing,” Rimsha says. In October of 2016, YCT held a bake sale in protest of affirmative action, where they sold cupcakes to students at different prices based on their ethnicity. They were also responsible for planning “Catch an Illegal Immigrant” event in November of 2013 that was cancelled due to fears of University retaliation. “Given that this type of hate speech was allowed, and for YCT to just not receive any consequences--it’s just so disappointing,” Rimsha says. Additionally, Rimsha reported that police did nothing to intervene when fellow students yelled things at the protesters such as, “No one believes you,” or “Kavanaugh was right.” Angel says police presence at the rally also prevented some black students from participating out of fear of being targeted if tensions arose. This was damaging to these students’ ability to share their experiences and receive support, as well as to the organizers’ intent for the rally to be as inclusive and intersectional as possible. While the option of police presence was originally offered to the organizers as a protective force against counter-protesters, Rimsha, Angel and Sonya told ORANGE they felt that they themselves were the ones being policed. Student poses with the poster she made for the rally. One important issue that events such as the YCT demonstration have brought to light is the societal perception of post-traumatic stress disorder (PTSD) as a result of sexual assault. In a letter from a student suffering from PTSD that was read at the rally, she wrote that she feels PTSD from sexual assault is often trivialized and not seen as a valid illness, despite the fact that sexual assault is the primary cause of PTSD in women. According to the author of the letter and the organizers, YCT’s demonstration was in violation of school rules. “If UT refuses to take action against YCT, survivors have a case against them and can take legal action,” Angel says. 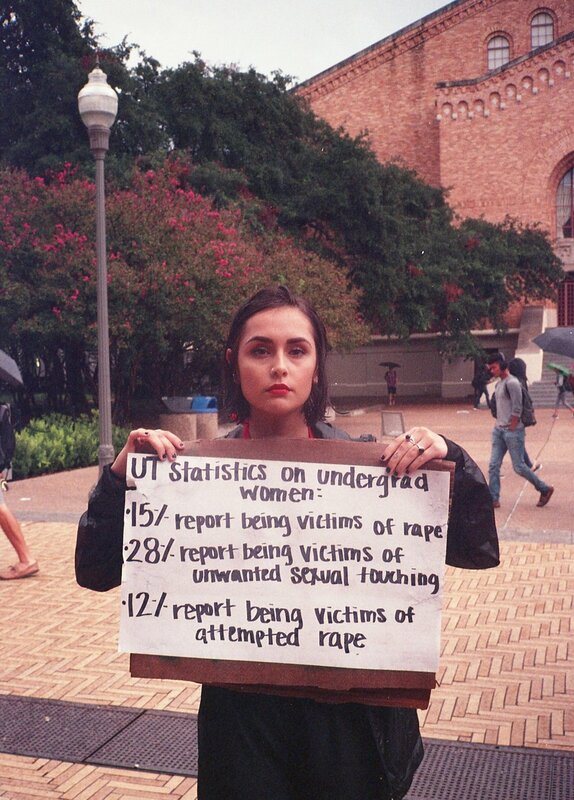 According to Angel, the author of the letter is asking for student survivors to send her testimonies if UT continues to refuse to take action. The rally was an emotionally charged and difficult experience for countless survivors who came out to share their stories and advocate for themselves and so many others. Sonya expressed feelings of gratitude for the sense of solidarity and community the protest was able to create while navigating such a challenging issue. “A really impactful aspect of rally was what a collective effort it was,” Sonya says. “So many people were reaching out consistently throughout the rally offering their help, checking in about our needs and donating supplies. There were even other organizations coming to the forefront to do that work. 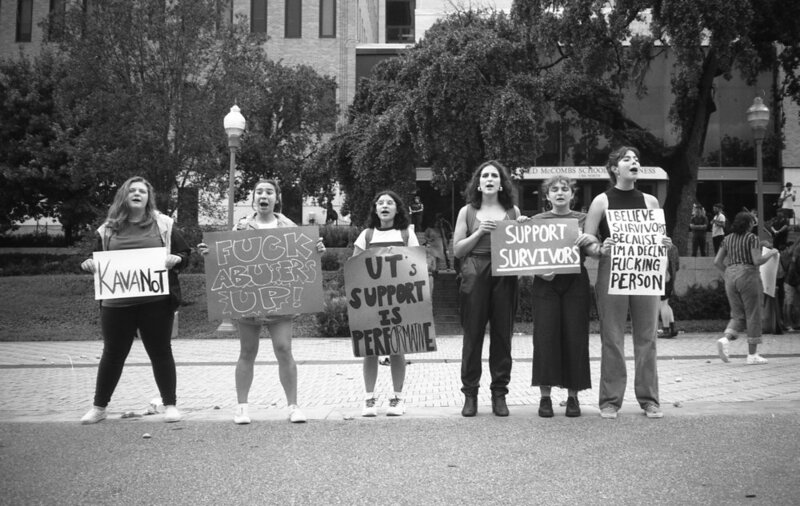 It didn’t feel like we were doing anything alone.”Students who wish to submit testimonies regarding sexual assault experiences and/or reactions to the YCT demonstration for the purposes of urging UT into action are encouraged to contact the author of this article. Submissions can remain anonymous.